From Where does inspiration come? Kandinsky has been called the father of abstract art, which is art that does not attempt to represent an accurate depiction of a visual reality but instead uses shapes, colours, forms and gestural marks as the main subject. Wassily Kandinsky was born in 1866 in Moscow where he studied economics and law. Only in 1896, when he was 30 years old, did Kandinsky decide to become an artist. He was especially interested in colour which he believed had the ability to put viewers in touch with their spiritual selves and as time went by he became more concerned with the power of colour in describing what he was feeling. Gradually his paintings became more and more abstract. Music also played an important role in the development of Kandinsky’s abstract paintings. He was influenced by the famous Viennese composer Arnold Schönberg who abandoned tonal and harmonic conventions in his compositions the same way that Kandinsky rejected the figure or recognizable objects in favour of shapes, lines, and discordant colours. Kandinsky gave many of his paintings musical titles, such as Composition or Improvisation. In this painting the left side has geometric rectangles, squares and straight lines in bright colours while the right side has more abstract shapes and darker colours creating different emotions. 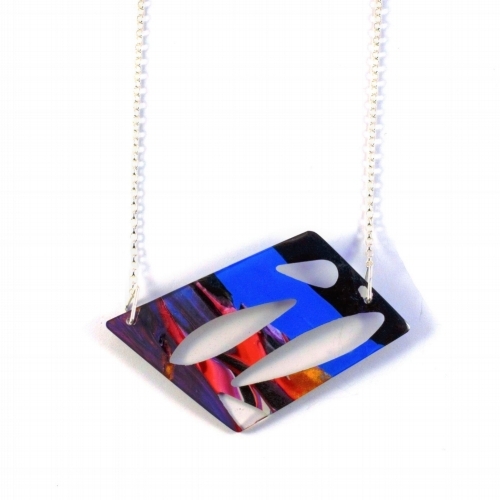 Kandinsky’s work has been an important inspiration for a number of our designs, including this abstract necklace which combines vibrant colours and clear resin to produce a quirky and contemporary piece of jewellery.